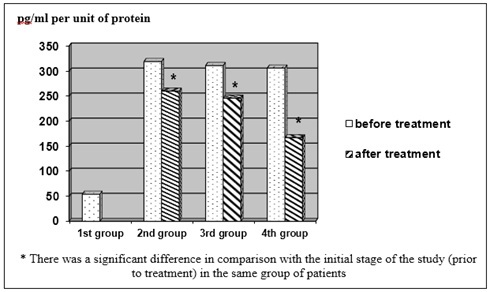 The article examined the application of different methods of treatment and their effect on the regional (in induced sputum) level of pro-inflammatory cytokine TNF- α in patients with chronic obstructive pulmonary disease (COPD) who had had lung TB. It highlights the beneficial use of the treatment of acute phase of COPD by combining β2 - agonist and an anticholinergic medication (Berodual) and doxofylline (Aerofyllin) for correction of the regional (endobronchial) cytokine imbalance of homeostasis. Y.V. Ivanova. Effect of medications of various groups on pro-inflammatory cytokine tnf- α level in induced sputum in patients with acute copd affected by lung Tb. 2014; 3(1): 77-79.